Weekly Challenge #120: "Tangleation Nation; Bales"
I love using Bales, it makes for a fabulous adventure.. Tangleations are my favorite. I just love figuring out new things to do with basic patterns. I so appreciate the wonderful challenges that Laura sends our way. The template inspires and calls out to me, the pen hesitates again and again but voila I conquer! Thank you so much Erin for the dare and your wonderful efforts to give us a fun Saturday activity! Not dare related I just used a real tile! This was fun! Weekly Challenge #119: "Ebony and Ivory"
What a rich fun challenge, thank you so much to Maria and Laura for the inspiration! I am going to be going places with this opportunity that I do not even know yet, So much to explore! 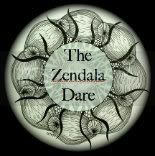 My son talked me into only shading half of each zendala dare......crazy but it works. Weekly Challenge #118: "UMT v. XVI - Kuke"
I finally came up with something I was willing to share for the challenge. I am having one of those block moments in tangling. Kuke is a great pattern, I am just stalled in my creativity! Maybe it is the result of several busy weeks. It was fun to just play with kuke and I look forward to many fun tiles using this pattern. This week we have a guest stencil from Genevieve Crabe! The template is really beautiful, my first thought was that it could stand alone without any zentangle. It was really fun to work with. I had such a busy weekend that I will just quickly post what I came up with. Weekly Challenge #117: "New Official Tangle: Shway"
The challenge this week was to work with the new official zentangle pattern "Shway" Totally geometric and fun, I wonder if I can eventually turn it into organic....humm....I'll be working on that. Big week, my daughter will be marrying on Sat. and thus the web page design has been changed to anticipate the day! I need to add one more exciting piece of news....my sweet little grandson arrived this morning and he is so fabulous! The 6 hour drive was worth it just to hold him for an hour. How I love you little A.W! The first of the month dare always has a twist. This month we are only to use pencil for the template. It was fun...but hard to define. I finally decided to use an art pencil to get better shading. It took a while this week, however, I couldn't not do the dare. I think I made it a bit too busy, but it was fun. I will go look at yours now. The decor for the site is in celebration of my daughter's wedding on May 11th.